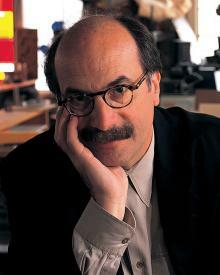 Born in Barberton, Ohio, United States, David Kelley trained in electrical engineering at Carnegie Mellon University before working for National Cash Register and Boeing. Frustrated by the many barriers to innovation in the field of engineering, Kelley applied to Stanford University to study product design, where an early consultancy project involved leading the team that designed the first Apple Computer mouse. Through his Stanford connections, Kelley met the British industrial designers Bill Moggridge and Mike Nuttall, co-founders of IDEO, the multi-disciplinary design firm formed in 1991. Kelley saw team-based integration of engineering, design and human factors of research as essential to innovation, and IDEO has since gone on to become a global company with high profile clients including Procter & Gamble, Eli Lilly, Pepsi and Samsung. David Kelley became a professor at Stanford University in 1991, and was later named Donald W. Whittier Professor of Mechanical Engineering, heading the department in which he had previously studied. One of America's leading advocates of human-centered design, through his teaching at Stanford, as well as his continuing role as Chairman of IDEO, he has been greatly influential in moving the disciplines of engineering and design much closer together. Taking many of IDEO’s founding principles into the educational arena, Kelley has been responsible for educating numerous generations of product innovators that have emerged from Silicon Valley. Building on this legacy, in 2004 Kelley founded the Hasso Plattner Institute of Design at Stanford, often referred to as the “d-school”. With its multi-disciplinary curriculum, the “d-school” has drawn its faculty from computer science, social science, business and engineering, integrating these fields through design thinking and design methods. One of the world’s most innovative design teachers, Professor David Kelley has received numerous awards including the Chrysler Design Award, the Smithsonian’s National Design Award in Product Design, and the Edison Achievement Award by the Thomas Edison Papers at Rutgers University.